More than 60 percent of Vermonters live in a rural area. And for over 30 years, access to quality care in these areas has been hindered by the state’s certificate-of-need (CON) laws. These laws require those who wish to open new healthcare facilities, expand existing facilities, or even purchase new equipment, to first obtain permission from a regulator. The regulator—in this case, the Green Mountain Care Board—is charged with assessing whether or not the proposed service is needed by the community. The advocates of CON laws claim that by asking providers to demonstrate the need for new services, only those services that benefit the community will be offered. The half-century-long experience with CON laws suggests that they are associated with limited supply, higher prices, and lower-quality care. 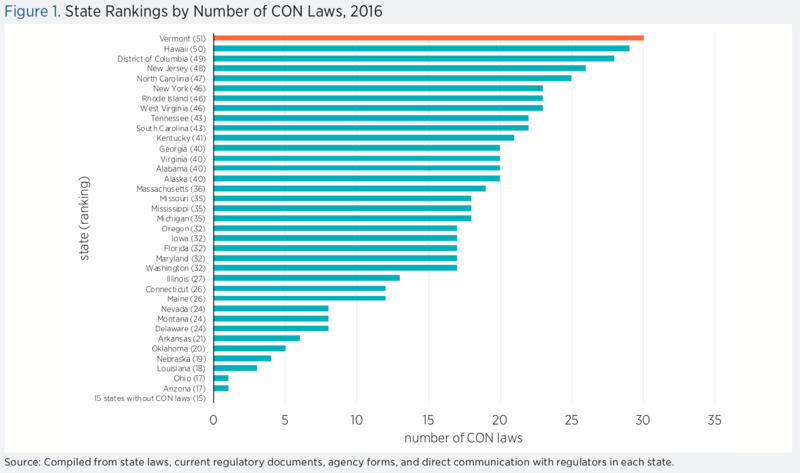 On the supply side, researchers find that CON laws are associated with fewer dialysis clinics, fewer hospice care facilities, fewer hospital beds, and fewer hospitals and ambulatory surgery centers in both urban and rural areas. They also find that residents must travel farther to obtain care and that CON laws result in greater racial disparities in the provision of care. As CON laws have restricted supply, they have also been associated with higher costs of care. Research also finds that the quality of care suffers under CON laws, resulting in more postsurgery complications and greater mortality rates. Vermont currently requires a certificate of need for 30 different services. That is more than any other state (see figure 1). Extrapolating the results from studies of CON and non-CON states, scholars at the Mercatus Center at George Mason University estimate that a Vermont without CON would likely experience the following improvements: a $228 decrease in annual healthcare spending per person; 5 new hospitals in rural areas, where there are currently 13; and a 5 percent decrease in deaths from postsurgery complications. Research suggests that scaling CON laws back would lead to greater access to care, lower costs, and higher quality, with best results obtained by repealing them entirely.